Actor Surya was earlier accused by Prem Kumar (a Football Player) for slapping him during a verbal fight with an elderly woman on road regarding a small accident. It is said that they were not letting her get away and were threatening her that they will break her car glass windows if she doesn’t pay them. Actor Surya who was on his way to his shooting interfered in this, solved the issue & informed the police. The boy was not paid anything so he gave a false complaint on Actor Surya regarding the issue. He also added that Actor Surya came nearby and slapped him twice, which got him brain fever, vomiting, head pain and etc as he claims. 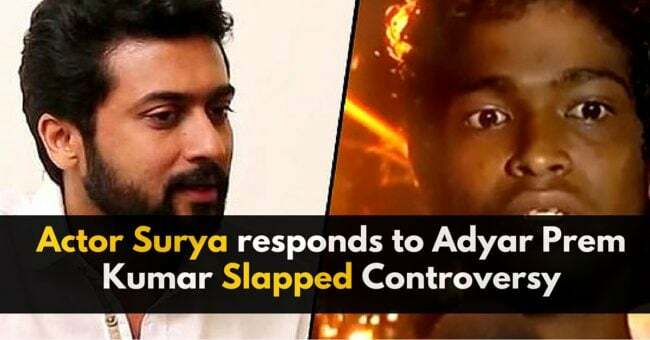 Finally after all this drama, Actor Surya gave an official reply on this controversy. Guess what, He didn’t even slap him.